The product, which is sold only in the U.K., will now be called "Kleenex Extra Large"
Kleenex Mansize tissues are pictured in London, Thursday, Oct. 18, 2018. 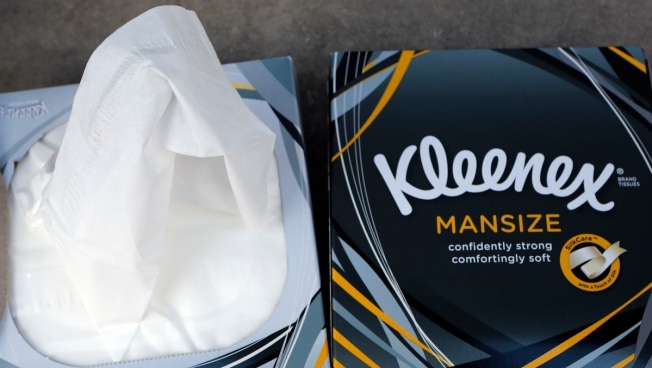 Kleenex maker Kimberly-Clark says it will re-brand its "Mansize" tissues after consumers complained the name was sexist. Kleenex will re-brand its "Mansize" tissues after consumers complained the name was sexist — touching off a social media conversation about what's in a name. The company behind Kleenex, Kimberly-Clark, said Thursday that the product, which is sold only in the U.K., will now be called "Kleenex Extra Large." Packages for the tissues describe them as "confidently strong" and "comfortingly soft." Kimberly-Clark told Britain's Daily Telegraph that it in "no way suggests" that being both soft and strong was "an exclusively masculine trait, nor do we believe that the Mansize branding suggests or endorses gender inequality." "We are always grateful to customers who take time to tell us how our products can be improved, and we carefully consider all suggestions," the company said in a statement. The tissues, which had been on shelves for 60 years, were launched at a time when large cotton handkerchiefs were still very popular and the brand offered "a unique disposable alternative," the company said. It remains one of their most popular products, with over 3.4 million people buying the tissues every year. Among the more memorable casualties was stationery maker BiC, which ran into disparaging comments when trying to market pink and purple pens "for her." Amazon was flooded by reviews poking fun at the strategy and the notion that it was "designed to fit comfortably in a woman's hand." In another example, the British grocery chain Waitrose on Thursday said it will be changing the name of its Gentleman's Smoked Chicken Caesar Roll because of complaints the name was sexist. The roll, which is part of celebrity chef Heston Blumenthal's range, contains anchovy mayonnaise, similar to a classic product called Gentleman's Relish created in the 19th century. Amy Lame, who was appointed by London Mayor Sadiq Khan as the capital's first Night Czar in 2016, posted an image of the product on Twitter with a smirking emoticon. "I never knew sandwiches were gender specific," she said. "I'm female but thankfully Waitrose let me purchase this anyway." "It's never our intention to cause offense — we're not dictating who should eat this sandwich," the company said in a statement. "We hope anyone who tries it will love the distinctive flavors."